You can sign up on the website under class registrations! Will Continue to Add New Classes as they are scheduled! 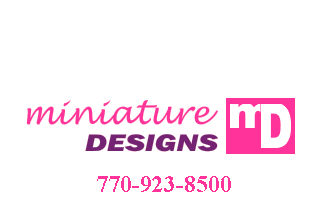 For more information call Miniature Designs or check the website registration! April 26th, 27th, & 28th, 2019: Tom Bishop Productions Chicago International Show & Sale. Friday April 26th, 2019. Salesroom opens 10am-5pm. Exclusive Preview Show & Sale Friday, April 26th, 10am-5pm, Saturday, April 27th, 9am-5pm. Admisssion is $25 each. Pre-registered Preview is limited to 600. Tickets WILL NOT BE available at door and includes early buying privileges and 3 day Admission. Saturday, April 27th, 2019, 10am-5pm and Sunday, April 28th, 2019 11am-4pm. Daily Admission: Adults $10, Children under 12-$5(no strollers). Marriott Chicago O'Hare, 8535 W.Higgions Rd., Chicago, IL 60631. For more information contact Tom Bishop at bishopshow@aol.com or 561/434-6622. November 1st, 2nd, & 3rd, 2019: Philadelphia Miniaturia 2019 Show & Sale. To be admitted on the 1st, you must purchase a preview ticket for $25.00. It covers full weekend admission. Preview Hours are 6:00pm-9:00pm Friday, 10:00-5:00pm Saturday, and 11:00-4:00pm Sunday. General Daily Admission for Saturday or Sunday Only is $10.00 Adults and $4.00 children under 10. Crowne Plaza Hotel, Route 70(Marlton Pike) Cherry Hill, NJ. for more information contact: Kimberly Sher at www.philadelphiaminiaturia.com or 267/684-6276.